With plenty of press building up to its online debut today, I decided to go on a personal media blackout for SOLO: The Series to come in cold as any average potential web series viewer. It’s a sci-fi show, with some space ship special effects. All right, SOLO, I’m listening. What amounts to the cold opening provides a perfect tone that the remainder of the episode tries and almost succeeds in capturing – what will entertainment be like in the future when space travel becomes yet another fascinating place for reality shows to soil? Pretty much just as awful as they do in today’s world. 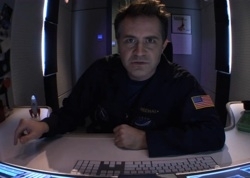 The reality show in question is set on a ship headed for Mars and back, with everyman dunce Scott Drizhal (creator/writer/actor Jonathan Nail) alone save for the AI aboard the ship. When the show is canceled, everyone on the technical crew on Earth is fired, leaving Jack Spratt (Jay Caputo) stealing equipment to try and bring Scott home. Now, give SOLO credit for one thing: they’re not subtle, and they don’t want to be. All of this is perfectly encapsulated in the first scene we see on Earth. In trying to tell the crew they’re fired, Spratt decides to say there’s a bomb threat – and everyone stampedes out. References to 2001: A Space Odyessy are obligatory and SOLO just acknowledges it and moves right along. I could sense a bit of Mystery Science Theater 3000 in there, but I’ve yet to notice any overt mentions. Pacing on the show is great – information is doled out in just the right amount without getting too exposition-y – and the visual effects, while inconsistent at times, usually have a nice polish to them. Luckily, for the tone of the show, they don’t need perfection, and sometimes the obvious green screen moments help with the comedy. As far as characters go, in the first couple of episodes (I’m press, I got to watch the first three, deal), Scott is way flat, alternating between completely dumb and completely terrified. The moment Scott started having interactions with his wife, the character began to add a dimension. He’s not a fully fleshed-out human yet, but I have faith. And speaking of the wife, if scene stealing a criminal offense, Michele Boyd (The Guild) would be doing a life sentence at this point. In the pilot she doesn’t show up until about halfway through, and up until that point I wasn’t sure about this series, but the moment she did, the words “thank God” fell from my mouth – unintentionally in sync with her line. She’s the sole reason why and how these disparate elements are able to merge into a cohesive whole. As Scott’s wife Rebecca, she’s able to play the pissed off spouse without succumbing to the ever-lingering trap of Shrew Wife Syndrome. It’s an easy trap to fall into, and difficult to avoid, but from what I’ve seen, she’s managing without any trouble (call me). The rest of the ground crew are particularly funny – I’m not completely sold on the characters Ratish Gupta or Gerry Simon (Amol Shah and Melissa Dalton, respectively), but they have their moments. I’m worried that Ratish won’t be given enough to become more than “bumbling Indian engineer.” There’s some definite realism in Gerry’s nerd-girl character, with a funny couple of chuckle-worthy tossaway lines. The show is shot very well – and very simply. A web series doesn’t have to prove itself by making as many trick shots as possible. Sometimes it’s just better to let the scene breathe, and SOLO does that well. The soundtrack is effective without being overbearing, heightening moments that need to be heightened and allowing the scene to do the work rather than covering up deficiencies with music cues. All in all, SOLO: The Series is very promising. With a couple of plotlines looming on the horizon, it can be very easy for them to veer off track, but they have a great foundation and seem to be willing to build characters into actual people. As long as they maintain that core honesty, the surrounding hijinks will remain funny, because funny things would be happening to people we care about, not characters in a show. Win, Fail or Trainwreck: A solid Win. Even in the uneven pilot there was plenty to enjoy. They’re off to a great start, and though there are a lot of pitfalls along the way, this show has a good head on its shoulders and is starting to mellow out some of the over-the-top nonsense for more character-based humor. When you have the sort of talent amassed on a show like this, showing off how wacky you are just covers them up. SOLO seems to have learned that lesson early.